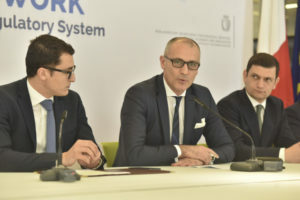 Online-gambling hub Malta is moving ahead with plans to modernize and streamline its framework of laws pertaining to both online gambling and gambling in general, with a new bill, called simply the Malta Gaming Act, already being positioned for its initial reading before the country’s Parliament. The announcement regarding this overhaul of Maltese gaming law came from Malta’s Parliamentary Secretary for Financial Services, Digital Economy & Innovation, Hon. Silvio Schembri. At a press conference called by the country’s regulatory body, the Malta Gaming Authority, Schembri announced plans for the new bill. All existing Maltese gaming law is set to be repealed by the country, to be immediately be supplanted by the sweeping new regulations. The MGA has been bruised in the past over its historically close relationships with certain elements of nearby Italy’s powerful organized-crime families, though Malta and the MGA have made significant forward strides over the past several years, cracking down on several Italian Mob operations. Malta’s continuing tightening of its legal framework and its forward-looking plans with technologies such as blockchain implementation are helping to advance its goal of being one of Europe’s — and the world’s — online-gaming hubs. Joseph Cuschieri, the soon-to-depart Executive Chairman of the Malta Gaming Authority (MGA). As for the new legal framework, its other important areas of focus include “consumer protection standards, responsible gaming measures, [and the] reporting of suspicious sports betting transactions in the fight against the manipulation of sports competitions and objective-orientated standards to encourage innovation and development.” Yeah, that last one’s a mouthful, good intentions notwithstanding. Exempting B2B licensees from gaming tax, thus increasing Malta’s competitiveness as a hub for B2B activities. Cuschieri, in fact, will soon be leaving his role at the MGA. But he won’t be straying too far; he’ll become the CEO of the Malta Financial Services Authority, a role which the Maltese government is still defining, and he’ll be working arm-in-arm with his former counterparts at the MGA.